The Bookshop of New Beginnings was originally published as Summer at Bluebell Bank. The title and cover have recently been changed but I think this is a much more substantial story than even the new cover suggests. Rather than being cosy chick-lit – and there’s nothing wrong with that at all, who doesn’t love a bit chick-lit? – I feel this is contemporary women’s fiction. Emily Cotton has always wanted to have her own bookshop and has finally bought an old run-down building in Wigtown, which is officially Scotland’s National Book Town. 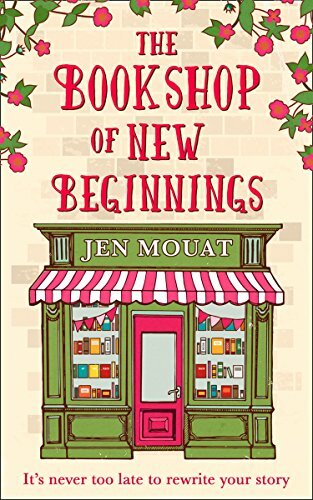 (Incidentally, you can read the rather excellent guest post Jen Mouat wrote about her road to publication and how Wigtown inspired her by clicking here.) Feeling rather overwhelmed at the task ahead of her, Emily emails her friend Kate who lives in New York. Kate immediately quits her job and heads back to Bluebell Bank where she spent many happy summers as a child. She had had an unhappy childhood living with her alcoholic mother and for her the Cottons were a large welcoming family who were “her sanctuary, her solidity in this world.” They fulfilled her need for something she never really had, a place she felt she belonged. So many questions filled my mind as I was reading. Why did Kate immediately decide to go to help Emily? Why had the once inseparable friends all but lost touch. Why did Kate split up with childhood sweetheart Luke and flee? What did Emily feel she should confess to Kate? There were so many mysteries at the heart of the women’s relationship. There were secrets, guilt, lies of omission and a perceived betrayal. I was completely absorbed in the story from beginning to end. I actually felt quite emotionally drained by the time I had finished this book. To me it’s a sign of a really great book if it can evoke such an emotional response to the characters and their situations and The Bookshop of New Beginnings did that for me. It is an excellent read about taking second chances and being open to new opportunities and I highly recommend it. My thanks to the publishers HQ Digital for my copy of the book from Netgalley. The Bookshop of New Beginnings is available now as an ebook. You can order a Kindle copy online here. It’s always been Emily Cotton’s dream to own her own bookshop. But sitting among shelves of haphazardly stacked books in a damp old barn, the reality feels a little different. Kate Vincent hasn’t been back home in six years. But when she receives a desperate email from her childhood best friend begging for her help she doesn’t stop to think. Scenes of idyllic holidays with the Cotton family dance in her mind and she books a one-way ticket home to Wigtown. But life for the Cottons isn’t all as she remembers and the secrets which once drove Kate and Emily apart are finally threatening to come to the surface. Now as the pair work together to save Emily’s failing bookshop – can they too begin a new chapter of their friendship? I loved this book! I agree with your opening comments, Joanne – there is real depth to the characters. Oh and the setting is glorious – should do wonders for the Dumfries and Galloway tourist trade! Well you know what I’m going to say don’t you? If you loved it I will too. Must add to my TBR! I have this one on my Kindle, but under the old name. I like the new cover and the book itself sounds great. I must get round to reading it!